Once you have created an Upsell Funnel, it's time to add your upsell and downsell offers into it that you'd like used! These will be the offers that are presented to your customers post-checkout when the Trigger Product(s) associated with this funnel are purchased at checkout. Create a new offer page: Select your offer product you'd like used from the product selection popup. Copy an existing offer page: Select the Upsell Funnel and Offer Page you'd like to make a copy of from the dropdown menus. *Note: In order for a store product to be used as an upsell/downsell offer, it is required to be visible to the "Online Store" sales channel in your Shopify admin. 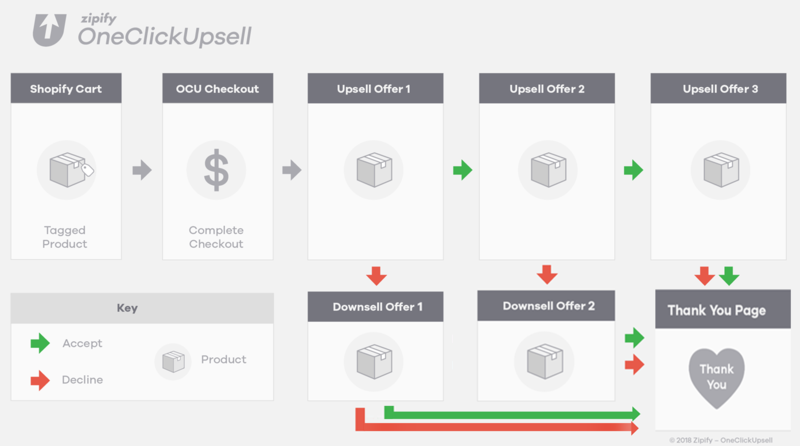 Once you choose your first upsell offer product, it will open up the option to select your first downsell offer product. The downsell offer is optional. This downsell product will only be shown if the first upsell offer is declined. Just like for the first upsell offer, click the "Choose Product" button to select your first downsell offer from the product selection popup or to make a copy of an existing offer page. The same process applies for choosing your second and third upsell offers and your second downsell offer (optional). Click the "Gear" icon next to the "Publish Funnel" button in the top-right corner to change either the Funnel Name or the Upsell Tag. Hover over the "more options" menu (3 dots) and click "Rename Offer". Enter the new offer name and click the Save button. *Useful for distinguishing between similar offers with variations within a funnel and/or for viewing at-a-glance information about offers within a funnel, especially when a Split Test is being used. You can change the order of your offers within an Upsell Funnel by clicking the "Change Priority" button and simply dragging and dropping the offer cards to a different spot. If you drag a card on a spot that's already occupied by an existing offer, the two offers will swap places. Note: The funnel needs to be unpublished before changing the offer priority. Rename Offer: Click this option to rename the offer within the funnel. Edit Offer Page: Click this option to open the Offer Page Editor to make all of your offer page edits and adjustments like; product, offer and appearance. The Offer Page Editor is gone over in-detail in this help article. Create Split Test: Click this option to create a split test for the particular upsell/downsell offer product in the upsell funnel position. Detailed information on this feature is gone over below. Change Product: Click this option to change the upsell/downsell offer product you'd like used in the particular upsell funnel position. Delete Product: Click this option to delete the upsell/downsell offer product from the particular upsell funnel position. We provide the ability to Split Test (A/B) any and all of the upsell/downsell offers you've added to an upsell funnel! To create a split test for an upsell or downsell offer, simply hover your mouse over the "more options icon". Then hover over the "Create Split Test" option where you'll see 2 options provided; Same Product and Different Product. Choosing "Same Product", an exact copy of the offer page will be made so you can split test the same product against itself, but with an offer page design variation. This way you can see which offer page design for the offer product is performing best in that particular upsell funnel position. Choosing "Different Product", you can split test a different product in that upsell funnel position to see which one performs better there I.e., has a higher conversion rate. After you choose the split test type (Different Product or Same Product), the page will update to show which offer product is Page A (the control) and which is Page B (the variation). If that same product is added to the customer's cart, then this product won't be shown even if it's included in a split test I.e. one offer page in the split test would receive more Views than the other. The data for the split test would still be accurate (the Conversion and $ / View stats provide the most useful information) but there wouldn't be an exact 50/50 split of page Views in this situation. To start the test, click the "Start Split Test" button. Then click the "Continue" button on the popup shown next. Pages will be split test evenly at a weight of 50/50. Note: Starting a split test will reset the statistics (number of views, conversion rate and revenue counter) to 0 for the particular upsell/downsell offer position where the test is started. However, this will not affect the overall funnel stats. Statistics for your running offer page split tests update as soon as the action is tracked. So if someone is accepting an offer, you can check it almost in real time by refreshing the page. Once the split test has run for some time and you're satisfied with the amount of data gathered for it, it's time to either pause or stop the test and pick a winner. Click the "Pause Split Test" button to Pause the test. Once the test is in a paused state, all traffic will be directed to Page A until you either choose a winner or resume the test. Reset Statistics (resets all statistics to 0 for the split test). Depending on which action you'd like to take, click on one of the three buttons. If you click the "Chose Winner" button, you will then be prompted to pick either Page A or Page B as the winner. Once you make your choice, the split test will be completed and you decide what to do with the losing page variant. You can either choose "Keep Variant" if you want to use it in the split test again at a later time or you can choose "Delete Variant" to delete the losing page. The upsell offers will continue to be presented if the customer continues to accept the previous upsell offer presented. A maximum of 3 upsells offers can be presented. If they decline the first upsell offer, the first downsell offer will be presented. If they accept or decline the first downsell, they'll be taken to the TY page. If they decline the second upsell offer, the second downsell offer will be presented. If they accept or decline the second downsell offer, they'll be taken to the TY page.